As there are so few letters from the correspondence between Martha and George Washington—only three letters from George survive; two were discovered in the personal desk she left to her granddaughter Martha Custis Peter; she destroyed the others—I thought I would post this letter written from Boston by Martha to her sister. The General, myself, and Jack are very well. Nelly Custis is I hope getting well again, and I beleive is with child. I hope noe accident will happen to her in going back [to Virginia]. I have not thought much about it yet god know whare we shall be; I suppose thare will be a change soon but how I cannot pretend to say—A few days agoe Gen [Henry] Clinton, with several companyes Sailed out of Boston Harbor to what place distant for, we cannot find out. Some think it is to Virginia he is gon, others to New York—they have been keept in Boston so long that I suppose they will be glad to seek for a place where they may have more room as they cannot get out anywhere here but by water—our navey has been very successful in taking thair vessels; two was taken last week loded with coles and potatoes wines & several other articles for the use of the troops—If General Clinton is gon to New York,—General Lee is there before him and I hope will give him a very warm reception,—he was sent thare some time a goe to have matters put in proper order in case any disturbances should happen, as thare are many Tories in that part of the world, or at least many are susspected thare to be unfreindly to our cause at this time—winter hear has been so remarkable mild the Rivers has never been frozen hard enough to walk upon the Ice since I came heer. 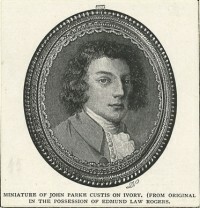 My Dear sister be so good as to remember me to all enquireing friends. . . .
John Parke Custis was the son of Martha Washington by her first husband Daniel Custis. Jacky, as he was called when he was young, and his sister Patsy were adopted by George Washington when he married Martha. It’s fair to say that Jacky was a disappointment to his mother and stepfather. He resisted all attempts to acquire the classical education necessary for college entrance and was disinclined to acquire the skills necessary to manage the plantation which he would inherit if Martha and George had no children of their own. Washington remarked to Jacky’s schoolmaster that he was interested in “Dogs Horses & Guns.” Briefly enrolled in King’s College (now Columbia), Jack dropped out to marry Elizabeth Calvert of Maryland in 1774. His stepfather disapproved of the marriage because he thought Jack too young and ill-equipped to support a family. Jack and his wife, had four children in quick succession. Sensing that a decisive battle was about to take place in 1781 at Yorktown, Jacky had himself appointed civilian aide-de-camp to General Washington in order to participate. Unfortunately he contracted “camp fever” (epidemic typhus) and died in November. A sad blow for the Washingtons as they had lost Patsy to a seizure in 1773 at the age of 17. Martha and George adopted Jacky’s two youngest children while their mother raised the older two. The families remained close and visited often. The letter appears on pages 41-42 of In the Words of Women.